If mystical experience and expression is to be found in the throat singing traditions of Tuva, it is especially brilliant when illuminated by genre-bending songstress Sainkho Namtchylak. Her music is as political as it is a reincarnation of Tuvan folk through a woman’s intuitive voice. Her breathy bird-like song flutters above an eerie cocktail of cheeky folk motifs, lungfuls of incantation, occasional heavy industrial beats, and windswept Oriental melody. Amidst experimentation with jazz and electronic music, Sainkho articulates through her famed improvisation a sensual expression of the human body that is difficult to find within paradigms that have repressed the honest communication of and connection to a holistic human identity. In contrast to the afflictions of doctrines perpetuating mind-body schism, Sainkho Namtchylak often demonstrates through her music shamanic elements that reveal an ecstatic painting of interconnectedness between self, music, and environment. Stripped away are unessential polishes, masks of perfection and sterile harmony. The essence of energetic and physical world unity is contained within the symbolic discomfort that her performance evokes, perhaps moreso for those unfamiliar with the expressive range of throat singing. In Western classical vocal music, the human voice is elevated to such technical refinement that the raw body is essentially disregarded as the source of sound in favor of the cerebral experience; throat singing emphasizes a auditory roughness that is virtually the opposite. On her album, Stepmother City, Sainkho Namtchylak aggressively articulates the intensity of the uninhibited human body. The song “Lonely Soul” is a regurgitation of the utmost primal, frightening sounds, culminating in an essential expression of raw life-energy. A similar explosion of brutal bodily reality can also be heard on “Lost Rivers” off of Sainkho’s 1993 album of the same name. While “Lonely Soul” sounds like chalky vocal butoh, “Lost Rivers” is the unbearably urgent shuddering of a hurting planet. The anxiety and estrangement of Tuvan throat singing can serve as reminders of the spiritual power within music — of the innate primitiveness of humans, which is self-destructive to ignore in a world of artificial security and consumer desires. The very discomfort that Sainkho’s music can bring, for instance, can help inspire an understanding of the whole self, where the spiritual is not distant from the body, and the voice contains power beyond language and sophistication. Where subliminal spirituality ends, deliberate statement begins. Tuvan musician Gennady Chamzyryn, accompanied by avant-garde and jazz musicians Ken Hyder of Scotland and Tim Hodgkinson of England, released a promising album in 2008 entitled Infinity.13 In a fusion of traditional instruments, chanting, and algorithmic sound processing, Infinity addresses one of the most challenging questions on Tuva’s current musical experimentation: how is it possible to inspire a uniquely Tuvan spiritual experience through untraditional means? The length of the album is 20 minutes, and it can only be played on a computer with the use of special software that comes with the disc. Every time the disc is played, the software is programmed to select sound recordings in unique compositions, so that each time Infinity is heard, the outcome is entirely different. Impossible to pause, rewind, or fast-forward, Infinity explores the power of unpredictability, which places it as a mindful attempt to connect Tuvan music with spiritual philosophies. 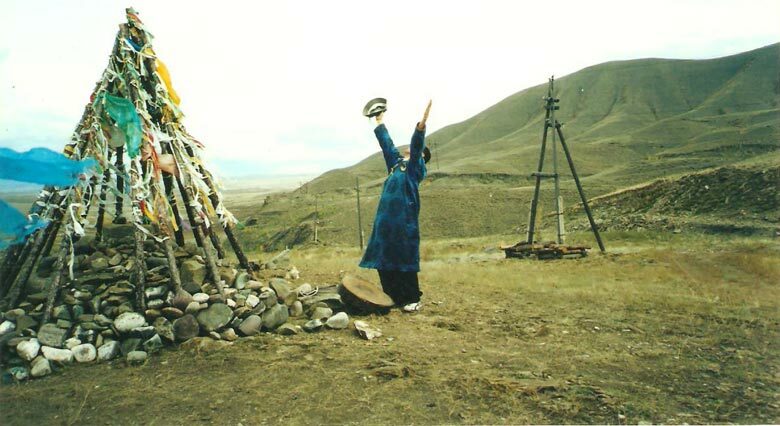 “Shamanic performances had a large element of improvisation as compared with the fixed rituals and liturgies of other religions,” writes Hodgkinson in his essay, “Transcultural Collisions: Music and Shamanism in Siberia”.14 One does not simply record a shaman and call it enlightenment. A mentality that steps away from deliberate musicality is somewhat radical to the West, as it challenges not only musical aesthetics but world perspective and experience. Tuvan shamanism relies on instruments to help create a spiritual experience, but there is no scripted musicality about it. That innate spontaneity, also explored by Sainkho Namtchylak, was then the focus of the K-Space project, essentially allowing for an interpretation of the internalized experience of Tuvan mysticism in a musical context. 7 “Female Throat Singing”, Tyva Kyzy. Retrieved 2013-04-16. 9 “Russian Shamans Vote for First Leader”, rferl.org. Published 2009-05-10. Retrieved 2013-04-16. 10 Laurie Anderson, Laurie Anderson. 11 “Tuvans”. MinorityRights.org. http://www.minorityrights.org/?lid=2498. Retrieved 2013-04-16. 12 “Tuvans keen to protect traditions”, BBC News. 2009-09-19. Retrieved 2013-04-16. 13 “K-Space group releases first CD that plays differently every time.”, PRLog.org. Published 2008-12-26. Retrieved 2013-04-16. 13 K-Space – Infinity, SunSeaStar. 14 “Transcultural Collisions: Music and Shamanism in Sibera”, Tim Hodgkinson. Published 2007-09-25. Retrieved 2013-04-16.